January 2016 In a pub trick, can you balance coins on edge as shown in this image? Well, OK, this is not a fair pub challenge unless you happen to walk into the pub with two strong magnets. Moreover, you will need coins containing steel, which is not characteristic of United States coins. Now that I have eliminated any chance of you being able to astound your pub mates with this trick, here is the video about it, but the challenge is to explain what you see. A steel coin will be attracted to a magnet because of the iron it contains. If you place such a coin near, say, the north pole of a horizontal magnet, the coin can align with the magnetic field lines such that it rests on edge on the pole and is stable. The side touching the magnet is then a south pole and the opposite side of the coin is a north pole. If you pull the coin directly away from the magnet and release it, the coin will move back to the magnet and probably crash into it. There is no force to oppose the magnetic attraction. In the video the demonstrator uses two magnets with opposite orientation (north pole next to south pole). Below this arrangement the magnetic fields from the magnets are superimposed, creating a net magnetic field. At about mid-length along the magnets, that net field points away from the magnets. Here again a coin can be positioned in a stable way so that its edge is against the magnet. But you can also move the coin down so that its edge rests on the rim of a container. When you release it, the coin can remain there if the upward magnetic force is somewhat weaker than the downward gravitational force. Sep 2011 A child’s block is stable because of its wide “footprint.” An upright domino is unstable because of its narrow footprint. If either is to be toppled, the center of mass must be rotated around a contact edge on the floor so that the center of mass passes above that edge and then beyond it. For the block, this requires a fairly large rotation --- a deliberate attempt to topple the block. For the domino, the rotation is much smaller and might occur in a chance disturbance. Balance is a bit different for something traveling around a curve. Suppose that you are traveling in a fast car taking a turn to your left. A frictional force from the car set acts on your rear end and legs, forcing them to follow the turn. As the rest of your body is dragged along, you lean outward from the turn, toward your right. A common interpretation of this leaning is that there is an outward (centrifugal) force pulling on your upper body. Although physics instructors frown at this interpretation (because no such outward force is actually acting), it is a useful prop for explaining what you experience. The car itself also leans outward. The true forces on the car are the frictional forces on the tires, causing the car to follow the turn, but you can interpret the outward lean as being a centrifugal force. The car is then somewhat like the child’s block. There is leaning, but the car’s footprint is wide and the center of mass would have to rotate significantly around the outer wheels for the car to topple over. Still, it might happen to a vehicle that is top heavy (high center of mass) and which is traveling too fast around a sharp curve. But at a slow speed, any vehicle should be safe from outward toppling in common street turning. Well, it should be safe if it has four wheels. But for some strange reason, the British Reliant Robin had just three wheels---one in the front and two in the rear --- and it was legendary for its instability in a turn, almost any turn, even while moving slowly. From the British television series Top Gear, here is a video demonstrating the instability. It would have been far safer to just walk to work. July 2011 This will be the first of a series of pieces about balancing, a subject of much use in The Flying Circus of Physics book and my textbook Fundamentals of Physics. Usually I talk about the instability of an object or person being due to the lack of keeping the center of mass over the support area. When the center of mass is off to one side of the support area, the gravitational force on the center of mass rotates the object around the support area and down to the ground or floor. Here is an example of a worker who almost magically avoids that result in spite of a huge change in the mass he supports. As he piles bricks layer by layer on his head, the center of mass of the system of him and the bricks gradually shifted upward but not horizontally. Here is a different example, in which the support area is taken through a turn. A truck is driven too fast for a traffic turn in a city street. The trailer is being propelled along the circular path by the tractor at the front, but the force that holds in the path is the frictional force on the tires from the street. That inward force is on the tires alone. The upper portion of the trailer goes into the turn only because it is attached to the lower portion. This arrangement causes the upper portion to lean outward. As you can see, it leaned outward so far that the center of mass was no longer over the support area of the wheel base, and so it fell. It may look as though there is an outward force (a centrifugal force) on the upper portion, but the force is actually inward and on the tires. The situation is much as you experience when taken in a fast turn in a car. The car seat (or seat belt) forces the lower part of your body to follow the turn. The upper part of your body follows along but tends to lean outward, as if being forced outward. Once a truck falls over, righting it is difficult. Here a series of photos I shot of a crew righting a trailer. The tractor pulling the trailer was going too fast as it went around a circular ramp leading to a freeway. The crew attached lines from two tow trucks, but pulling hard on those lines would have merely slide the trailer along the ground. To rotate the trailer, the crew placed airbags under the outer part of the trailer (what is normally the top part) and then inflated the bags. This procedure gradually rotated the trailer until its center of mass came up over the support line provided by the wheels on its left side. Once the center of mass cleared that critical stage, the gravitational pull on the center of mass provided a torque to continue the rotation until the trailer was again upright. However, the crew did not want the trailer to slam down into place, so they used lines from the tow truck to ease the trailer down. August 2011 The gravitational pull not only attempts to pull you down but it also attempt to rotate you around your feet. Normally you avoid toppling over by keeping your center of mass over your support area, the area that includes your feet and the space between them. The wider your stance, the more difficult it is for someone to push you off balance and cause you to fall. The same argument goes for most objects. For example, a toy block is difficult to topple whereas an upright domino is easy to topple. How about a baseball bat? If you are very careful and if the head is partially flat, you can balance a vertical bat with its head on a floor. Of course, the support area is very small and the bat is easily toppled. If, instead, you press the bat into dirt so that the support area is wider, the bat has a better chance of standing up. Still, you must work carefully, with small adjustments, until you find the right balance. Standing on two feet may be easy enough for you, partially because you probably have strong legs to maintain the position of your trunk. But a handstand, where you are upside down, being balanced on your hands is more difficult. Your arms just are not used to holding your trunk in position. Here is a video of someone who can not only maintain balance while being upside down, but does so by balancing on just two fingers. He, of course, runs the risk of breaking his fingers because, since they are not rigid rods, they can easily flex and buckle at the joints. The support area is reasonably wide left and right between his two fingers but very narrow front and back. That is why he falls forward and not off to the side. Still, I’ll post the item now with the challenge: what went wrong? Normally the center of mass of the loaded cart (cart plus the load) should be slightly ahead of the contact line that runs between the two points of contact the wheels have with the road. If it is to the rear of the contact line, the gravitational force on the center of mass creates a torque around the contact line, which tends to rotate the cart, lifting the donkey. If it is forward of the contact line, the force creates a torque that tends to rotate the cart in the opposite direction, bearing down on the donkey. If that is too much, the donkey soon quickly tires. So, the best location of the center of mass might seem to be right above the contact line. The drawback with that plan is that the balance is then unstable. If the cart is pulled very slowly along a smooth road, the balance probably can be maintained. But if the speed is greater and the road bumpy, the balance can easily be ruined. It can also be ruined if the load shifts to the rear, which must have happened in the situations we see in the photograph and video. Also, in the video we see the men remove some of the bags to bring the poor donkey down. However, do you see that one man makes the error of removing a bag between the contact line and the donkey? That bag would have helped rotate the cart back to normal. And here is a big excavator getting off a truck that is almost too small to hold it. And suppose you have material up in a railroad car. No problem. Just make the excavator climb up on top to handle the material. In the spirit of the holiday season, here is a video with 1:04 seconds of balancing enchantment from Walter Wick of the Connecticut Science Center. The physics is the same as in other balancing acts: You must keep the center of mass over (above and on a vertical line through) the support area. Here that support area is provided by a single Lego block, and Wick manages to balance an assortment of toys above it and off to both sides. One small point here. When the little mechanical robot comes out, threatening to topple the assembly, note that its collision with the pendulum at the left side causes the pendulum there to swing. That motion then causes oscillations of the wooden beam that supports the pendulum. And the motion of the beam then causes the pendulum on the right side to swing. Such transfer of motion to the right-hand pendulum occurs because the pendulums are matched in frequency. The left-hand pendulum can then set up a resonant oscillation in the right-hand pendulum. January 2012 Here I continue my fascination with the physics of balancing, that is, the physics of maintaining the center of mass of an object over its support area. The gravitational force acts at the center of mass, pulling downward. If that downward pull is off to one side of the support area, the force creates a torque that rotates the object around the support area, and then the object topples over. But if the downward pull is over the support area, there is no torque. The object might be unstable in that a slight push can topple it, but otherwise it remains upright. The first example this month is the balancing of several thousand coins on a single dime (a small American coin). As each additional coin is added, an identical coin must be placed on the opposite side of the structure to keep the center of mass over the dime. Before the second coin is in place, however, the center of mass is not perfectly over the center of the dime. However, the gravitational force on the center of mass still acts downward through the area of the dime. Well, that is the story initially, but as coins are added farther and farther from the central vertical axis, they tend to shift the center of mass out past the area of the dime. To counter this tendency, the core of the structure is built higher, to add to the mass near the central axis. Then an outer layer is added farther from the central vertical axis. Now the addition of another outer coin does not shift the center of mass very much because so much mass is near the central axis. The second example of balancing contains some amazing stunts by a balancer in Seoul. To accomplish this type of balancing, the balancer must find at least three point of contact between the two surfaces such that the center of mass is directly above the area formed by those three points. If there are only two points of contact, with the center of mass directly above the line connecting them, there can be balancing in principle but it is far too unstable to last. Even the slight nudge of a breeze or the chance vibrations of the floor can move the center of mass off to one side of the line, and then the torque from the gravitational force topples the object. April 2012 To maintain balance, the center of mass of a collection of objects must be kept above the “footprint’ (the support area) of the collection on the floor or ground. That is usually a lot easier said than done, but some people are very clever on balancing huge collections. Delorme has collected a number of such balancing acts, something he calls Chinese totems (which must be a play on words, from “to tote them,” meaning “to carry them”). On a three wheel cycle, someone must worry about stacking the load too much to the rear, which would cause the load to rotate around the rear axis, lifting the front end (a cyclist). It would tough to pedal then. However, stacking the load a bit too much to the front would not be a problem because the front wheel would prevent any rotation. The stacking in this trailer arrangement is more challenging. If the center of mass of the load is above the rear axle, the weight is supported entirely by the wheels. Then the laborer would have to propel the trailer horizontally but would not have to support the weight. But if the center of mass is forward of the axle, the load will bear down on the man in front and he would have to support the weight. What amazes me is that, for such a heavy load of objects with an assortment of sizes, a working solution can be found by trial and error. Imagine lashing things together to find a reasonable balance. Well, actually, this is more than just chair balancing because Henry Roichatin is balancing himself on a chair supported by two drinking glasses, which are supported by another chair, which is supported by four drinking glasses, and (as if that were not enough) he is positioned over very long fall on a mountain top where a sudden gust of wind could easily ruin his balance. Once he is in place, notice that he uses his arms (primarily) and legs to continuously adjust his balance, that is, to keep the center of mass of him and the higher chair over a horizontal rotation axis through the contact points of that chair and the glasses supporting it. He needs no adjustment to his left or right because the two contact points are well separated left and right. It is the forward-rearward adjustment that is crucial. I understand the physics behind balancing but I think I’ll pass on applying it by repeating his stunt. Besides, with my luck, there would be a sudden gush of wind and then I would have a few seconds to think about the physics of free fall. May 2012 There are so many bicycle videos on the web that picking through them is not always fun. But here is a video that really caught my attention because I think I understand some of the physics the performer has mastered. He not only can keep his balance on the bicycle, but he can also do it during a hard impact. Two features really impress me: Dickey’s ability to jump his bicycle up onto fairly tall structures and his ability to maintain his balance even during a hard landing. In a hard landing, the danger is being thrown over the handle bars because contact with the landing surface tends to stop the bicycle’s forward motion. To minimize this danger, Dickey lands on the rear wheel only and then falls forward so that the front wheel lands last. Thus, during impact he must maintain his left-right stability but not his front-back stability. To jump, notice that he first crouches as in a normal jump from the ground and then he leaps into the air by pushing off on the pedals. But as soon as he is airborne, he pulls the bike and legs up tight under him. So when he lands on the elevated structure, he is in a crouch with a low center of mass and ready to make any needed left-right adjustments. The pub challenge this month is to balance them on the rim of a common drinking glass. But you cannot fill the glass with something solid like sand or dirt and you cannot bury the glass up to its rim in something solid like sand or dirt. The solution is to fill the glass with water up to its rim and then lay a safety pin across the rim so that part of it lies on the water. That part is held up by the surface tension of the water, that is, by the mutual attraction between the water molecules. That attraction is so strong that the water surface will develop a dimple rather than allow a safety pin to break through the surface and sink. July 2013 Place a coin near the edge of a table. How far can you shift the coin toward the edge until it is on the verge of rotating around the edge and falling to the floor? You already know the answer: For the coin to be stable, its center cannot be shifted beyond the table’s edge. Although every particle in the coin is pulled downward by the gravitational force, we can assign the collective downward pull to the coin’s center of mass, which is located approximately at the coin’s center. If the center of mass is shifted beyond the table’s edge, the gravitational force produces a torque that rotates the coin around the edge, so that it falls to the floor. Thus, a single coin cannot have its center of mass beyond the table’s edge. However, given a pile of coins, you can build a bridge with them so that some are located entirely beyond the edge. October 2013 Take three pub glasses (pint glasses) and three identical table knives. Position the glasses so that they form an isosceles triangle, with each triangle edge slightly longer than a knife length. Can you position the knives across the tops of the glasses such that you can balance a bottle on top of them? This challenge seems impossible. A knife placed on any one of the glasses cannot even reach another glass, so how could there possibly be any way to build a support for the bottle from the knives. Ah, but there is a way if you position each knife to extend toward the center of the triangle and then arrange them so that each runs over a second knife and under the third knife. June 2015 Take any paper currency and fold it in half along its long central axis and then fold it one more time the same way. You can easily balance the currency horizontally on your outstretched first fingers, one near each end. But can you balance it with only one finger near an end? Of course not, because the weight of the paper on one side of the finger is larger than the weight of the paper on the other side. The mismatch produces a torque that rotates the paper around the finger, so that it then falls. Here is a video that shows a magic trick that prevents the torqueing and falling. This question is answered in every introductory physics class: because of the air through which the object must travel and the resulting upward drag force, the object’s acceleration a is always less than g. If the object is a stone and the fall is short, you will not notice the difference. But if the object is a flat sheet of paper released horizontally, you will certainly notice the difference. As solid as these arguments are, here are four situations in which a common object falls with an acceleration that exceeds g.
This traditional demonstration has long been used in physics classrooms but apparently with the wrong conclusion. A sheet of paper is placed on a larger, horizontal book and then the book is released. The book and the paper fall with approximate acceleration g. Whereas the paper is noticeably affected by air drag if released by itself, the book apparently eliminates the air drag by “plowing” a path through the air and disallowing the air to get beneath the paper and push upward. In its traditional presentation, the demonstration is supposed to demonstrate that if the effects of air are eliminated, the sheet of paper can fall with acceleration g. That is, the demonstration is supposed to be a substitute for one in which the paper falls in a vacuum. Recently F. Vera and R. Rivera of Instituto de Fisica, Pontificia Universidad Catolica de Valparaiso, Valparaiso, Chile, neatly showed that this conclusion is wrong. They arranged for the book-paper to fall, with a ball on top of the small piece of paper, but they also attached elastic cords around the book, to each side of the paper. The lower ends of the cords were fixed in place. The experimenters pulled the book upward to stretch the cords. When they released the book, all three objects accelerated downward, through the field of view of a high-speed video recorder. Here is a photo from their published paper, which is cited below. Not surprisingly, the book fell with an acceleration that was greater than g because it was pulled downward by the cord, and the ball fell underwent normal free fall with acceleration g. The surprise was the sheet of paper --- its acceleration exceeded that of the ball. That is, its acceleration was greater than g.
We have two conclusions here. (1) The traditional demonstration is not a substitute for the paper falling in a vacuum. (2) A sheet of paper can be made to fall with an acceleration greater than g.
The following video shows a board that falls by rotating around a hinge at its lower end. The board rotates because of the gravitational force that acts on it. That is, we say that the force acts at the board’s center of mass, causing a torque and angular acceleration around the hinge. A ball has been placed along the board. Once this assembly is released, the board rotates around the hinge and away from the ball, which then falls freely with an acceleration of g. Thus, the point where the ball was positioned must be accelerating downward at more than g. In fact, approximately the outer 1/3 of the board has an acceleration exceeding g.
Here is my sketch for my 1979 article in Scientific American, indicating how a plastic cup can be positioned to catch the falling ball. According to calculations, we get this paradoxical action if the board’s initial angle exceeds about 42 degrees from the vertical but not for smaller angles. If you hold the two ends of a rope or chain apart but at the same level, the shape of the rope forms a catenary (roughly in the shape of the letter U), and the rope or chain is said to be folded. If you let go of one end, during its fall, energy is transferred from the gravitational potential energy into kinetic energy, and so the speed of the end increases. But the shape of the rope also changes, with progressively less of the rope moving. Thus, the kinetic energy increases and also becomes concentrated in a progressively smaller amount of rope. The result is that the acceleration of the falling end can exceed g before it reaches its lowest point. If you have ever undergone bungee jumping, you have experienced this greater-than-g acceleration. As you fall, you move faster and faster because energy is transferred from gravitational potential energy to kinetic energy. But your speed also increases because less and less of the bungee cord is moving and so the kinetic energy becomes more and more concentrated in your end of the cord, until the cord is vertical. After that point, you experience an upward, spring-like force as the cord is stretched, until you come to a momentary stop. Recently Anoop Grewal, Phillip Johnson, and Andy Ruina of Cornell University in Ithaca, New York, reported that when a chain is held vertically and then released, its acceleration can exceed g as its links hit the floor and pile up. To make sense of this, first assume that the links consist of short, almost horizontal bars that are connected by lightweight vertical strings, one at each end. Picture the bar that is about to hit the floor, slightly tilted from the horizontal. When the lower end of the bar hits, the bar undergoes a rotation around that end, and thus the other end is accelerated downward. Therefore that other end pulls downward on the next higher bar and also on the rest of the falling chain. This additional downward pull causes the rest of the chain to fall with an acceleration greater than g.
December 2011 As any football fan knows (soccer to those of you in North America), a good footballer can redirect the ball by heading it, that is, allowing it to collide with the head or even actively hitting it with the head. Recently this practice has again been linked to brain damage. A single header is not likely to hurt the brain because the impulse is too small to tear the blood vessels between the brain and the skull or destroy any brain cells. Nor is it likely to rotate the head around the brain stem, causing damage there. That type of damage is the big worry in boxing, kick boxing, and other forms of fighting where a fist or foot is slammed into the head. A header is nowhere near as traumatic. Nevertheless, it is more than a pat on the head. Suppose the ball runs into a stationary head. The collision causes the skull to accelerate away from the ball. The skull then runs into the brain causing the brain to also accelerate. Eventually the skull stops. The brain then runs into the skull and also stops. Thus, the brain experiences trauma on the ball side of the head and also on the opposite side. Similar bipolar trauma is experienced by the brain if the footballer actively slams the head into the ball. In 2001, a team of researchers investigated the acceleration of a footballer’s head in a header, especially to see if a helmet can reduce the danger. In my textbook Fundamentals of Physics, I designed one of the homework problems based on that research. The problem centers on the acceleration of the head during the impact and gives the following graph of acceleration versus time during the impact. Note that the impact lasts less than 7 milliseconds, showing us the obvious fact that the collision is abrupt. The vertical scale is set by the parameter as = 200 m/s2, which is the greatest acceleration, occurring near the end of the impact. Let me put that acceleration in a better measure: It is about 10g units, or 10 times the acceleration due to gravity. That is certainly not a pat on the head. If this link between brain damage and heading the ball becomes established, it can explain why some footballers end up with poor mental performance (or worse, death as happened to the English footballer Jeff Astle who died at age 59 after displaying reduced mental capacity). However, the link is still controversial. Indeed, one 2007 study of female soccer players found no loss of cognitive functioning during a season of soccer. January 2012 Pouring tea from one container to another is easy because you have a lifetime of experience with the motion of something, even a fluid, falling through the air. However, suppose you tried pouring the tea while on a rotating platform. Unless you take into account some extra physics, you’ll end up with a mess. Here is a video of someone who has mastered that extra physics. When tea is poured in normal circumstances, the only outside force acting on it during its flight is the gravitational force. We know that force well and can position the receiving cup without much trouble. But if we are on a rotating platform two other forces also seem to act on the stream of tea. The forces are fictitious and only appear to act on the fluid stream. In the language of physics, the normal circumstances occur in an inertial reference frame because the reference frame (the room, floor, ground) does not accelerate. The view from the rotating platform is in a noninertial reference frame because the frame is undergoing centripetal acceleration. In such a frame, objects such as the falling stream can seem to be pushed by fictitious forces. Here are some freeze frames of the video. Note the strange shapes taken by the flowing stream of tea. The stream is certainly not in its familiar parabolic shape that the gravitational force normally produces. You are familiar with one of the fictitious force. You sense it every time you take a fast turn in a car or some other vehicle. You seem to be thrown outward from the turn by a centrifugal force (meaning outward-going force) but that is only because you are in a noninertial reference frame, the car, that is undergoing a centripetal acceleration (meaning inward-going acceleration). In the view of someone on the street, the only real horizontal force acting on you is a frictional force on your rear end from the car seat. That force is inward, causing the centripetal acceleration. As your rear end is forced into the turn, your torso is dragged along at a tilt. From your view, you interpret that tilt as being due to an outward force. The other fictitious force is the Coriolis force. To make sense of it, first suppose that we have a large, circular platform covered with frictionless ice along which someone on the ice can send a puck sliding. Paint a line on the floor outside the platform, set the platform rotating counterclockwise, and then have the person aim the puck toward the line. From our viewpoint standing on the floor (an inertial frame), the puck moves in a straight line toward the line and even slides off the ice to land on it. As the puck moves outward over the ice, the platform merely slides underneath it without disturbing it. Next, climb onto the platform and paint a line along a radius of the platform. Then sit at the center and, after someone starts the platform rotating counterclockwise, send the puck along the line. From that rotating reference frame (a noninertial frame), we see something rather strange. The puck does not slide along the line. Instead it veers off to the right of the line, seemingly deflected by some invisible force. That force is the fictitious Coriolis force. We can make sense of the Coriolis force in terms of your experiences while riding on an amusement-park merry-go-round. If you walk radially outward on the merry-go-round (from, say, an inner horse to an outer force), your speed relative to the ground noticeably increases --- positions farther out move faster because they must complete a circle in the same time as positions closer in but they have farther to go. So, as the puck moves outward, the speed of the underlying ice relative to the floor increases. In each given time interval, more and more of the ice moves underneath the puck, so near the rim, the puck is relatively far from the painted line. Here is the general result as seen from the noninertial frame. Regardless of which way you send the puck sliding, it will appear to be deflected to the right of a straight path if the platform is rotating counterclockwise and to the left if the platform is rotating clockwise. When the man in the video is rotating, he somehow must take into account not only the gravitational force but also both fictitious forces in order for the receiving cup to be in the right position. In fact, he must understand those forces for both clockwise and counterclockwise rotations. Well, I doubt that he takes a class in classical mechanics to do that. More likely he practices a lot when business is slow. However, here is a comfort. If you are a physics major and don’t fancy a standard job when you graduate, you could always put your classical mechanics to work in a tea stand. The question here is obvious: How does the snake do this? A skilled rock climber can climb an almost sheer wall if there are at least a few projections that can be grabbed or stepped on. One of the most severe challenges is a clinging technique known as a crimp hold, shown here in a figure from my textbook (Fundamentals of Physics). The climber has her shoes against the wall but without any purchase there for support. Her only support is at her fingertips, which she presses down hard onto a shallow horizontal ledge. We can consider the gravitational force on her to act at her center of mass (the dot with the label com). Not only does that force pull her downward but it also tends to rotate her counterclockwise around the contact point of her shoes with the wall. She depends on the forces on her fingertips to counter both the downward force and the counterclockwise rotation. The vertical force (labeled Fv) counters the downward force. The frictional force (labeled Fh) counters the rotation. Of course, she is in danger of her fingers sliding across the ledge. If the static friction is overwhelmed, she will begin to rotate and will then fall. So she does more than just hang on the ledge with her body weight. She crimps her hand so that the muscles force the fingers down hard on the ledge. That increases the upper limit to the static frictional force at her fingers tips, decreasing the possibility that the static friction will be overwhelmed. The snake climbs the wall in approximately the same way. Notice how much of its body extends along a horizontal line of mortar. When the wall was being built and a new layer of bricks was about to be laid, fresh mortar was spread across the previous layer of bricks and then the new bricks were slapped into place. A tool was then scrapped along the mortar line to remove any of the mortar that had been forced outward (somewhat like toothpaste from tube). In most housing constructions, the mortar remaining between the two layers of brick is concave with a rough surface. The snake can press part of its body into that concavity and then crimp the muscles along the body to grab onto the lower portion of the rough mortar. Another animal that climb on seemingly impossible walls is the ibex. Here are photos that show how they climb on the Cingino Dam in the Italian Alps in order to eat moss and lichen that grow on the dam wall and to lick salt from the stones. The walls on the upper and lower portions of the dam are steep but not vertical. So, if an ibex can find projections on which to stand, it can keep its center of mass over its support area (the area between two or more feet). To be sure, this is precarious but the ibex are skilled in such treacherous climbing. They are also aided by the design of their hooves. The bottom surface of each hoof consists of a parabola of hard material, surrounding a softer, flexible center. A leg can be stable even if just one side of the parabola is firmly on a projection. The softer area is effectively skid resistant, because it can hug a curved surface. At least one researcher claims that it also acts like a suction cup. Lots of other animals can cling by using various techniques. In The Flying Circus of Physics book I describe the strangest example: Geckos can climb walls and run across ceilings by means of a quantum mechanical interaction between the feet and the wall or ceiling. Someday I shall come back to this interaction here at the FCP site. March 2012 Modern blowguns are impressive weapons that shoot a slender, short arrow with enough momentum and energy to penetrate not only the targets that are used in blowgun sports but also skin and bone. In 2000, Thore Karlsson and Stellan Stahling of Sweden published data about the arrows shot with a particular type of modern blowgun, a metal tube with a length of 97 cm and interior diameter of 10.2 mm. The arrows were of two types: 11 centimeters in length, 1 millimeter in diameter, and 1 gram in mass, and 2.5 centimeters in length, 3.2 millimeters in diameter and 1.5 grams in mass. When mounted in the blowgun, each arrow was sealed by a plastic cone at the near end. The arrows are propelled by the pressure difference between the normal atmospheric pressure in front of an arrow and the increased air pressure produced by the person blowing into the near end. For the researchers, the blowgun was used by a novice but the speeds and kinetic energies of the arrows were impressive: 31 m/s and 0.5 joules for the longer arrows, and 28 meters per second and 0.6 joules for the shorter arrows. When aimed at a target of dry pine wood at a distance of 6 meters, penetration was about 10 millimeters for the longer arrows and 5 millimeters for the shorter ones. The researchers also used the shoulder blade of a pig as a target. Both arrows fully penetrated the target, with the arrow tips emerging from the far side. To aim a blowgun, experience certainly helps but here is a further guide. With the blowgun at your mouth, look directly ahead, focusing on “infinity” with each eye rather than on the target. Each eye will then produce a separate image of the target. Position the far end of the tube to be midway between those two images. The blowgun is then aimed in the correct left-right direction, and that may be enough for a nearby target. For a more distant target, you need to adjust the upward tilt of the tube, and that is where experience comes in handy. In 2008, Koji Tsukamoto of Kashiwa Minami High School in Kashiwa, Japan, and Masanori Uchino of Tokiwamatsu High School in Meguro, Japan, studied the ballistics of a blowgun model. They used either a wood match or a cotton swab that is blown with either a drinking straw or an acrylic pipe. They found that for the straw and for a consistent puff of air with each trial, a greater length of straw produced a longer flight distance. A longer straw means that the projectile is accelerated for a longer distance and emerges from the straw with a greater speed. Assuming that the straw is horizontal, changing the time the projectile takes to fall to the ground is independent of the emerging speed (it falls the same distance each time). However, how far it travels during that falling time does depend on the emerging speed. Thus, a longer straw produces greater emerging speed, which results in a greater travel distance. When the researchers switched to tubes that were longer than the straws, the results were a bit different. Between tube lengths of 1 and 3 meters, a longer length gave a greater travel distance. But for even longer tubes, there was no increase in travel distance. Either the projectile was reaching terminal speed as set by air drag, or the person blowing into the tube was at his upper limit. Depending on what grade school you went to, this whole discussion may bring back memories of the common prank in a classroom of shooting spitballs. A small piece of paper was waded into a sphere by the mouth and thus covered with spit. It was then stuffed into a narrow drinking straw and propelled as if from a blowgun. Someone in the back of the class could then shoot the spitball at the back of the head of someone sitting in the front of the class. I would love to see a study of spitballing. What is the typical emerging speed and travel distance of a spitball? How do those values depend on the length of the straw? Why must the spitball be coated with spit? (Dry paper will not fly.) How does the spit affect the friction between the ball and the interior wall of the straw? How does the increase in mass due to the spit affect the travel distance? Physics is everywhere, even in the antics of an unruly student. Thus, if you are currently a student and happen to get into trouble with the teacher for spitballing a fellow student, you might plead that you were simply doing a physics investigation. Well, actually, I cannot imagine a teacher falling for such a line. March 2012 One motto of this FCP web site and the FCP book is that physics is everywhere, if we will only look for it. Here is an especially cute example: Recently researchers at the University of Cambridge, Unilever R& D Port Sunlight, and the University of Warwick (all in the United Kingdom) produced a mathematical model of the common ponytail, the hairstyle worn by men and women worldwide. The common trait of the hairstyle is that the hair is gathered together by a rubber band or some other elastic band near the head and then allowed to fall as it may down the back of the head and neck. As the researchers point out, Leonardo likened such long hair as being streamlines in a fluid flow (the path a small leaf might take on a flowing stream. It can also be likened to a thin water stream meandering down a slanted plane. The point is that the bundle of hair in a ponytail is shaped by forces acting on the bundle and thus that shape can be worked out by modeling the forces. (4) an inward force (especially near the top) because of the constraint of the elastic band. (5) a force from the person’s back if the hair lays against the back, which tends to spread the ponytail. The interplay of these forces can vary between individuals. For example, the outward flare of a ponytail on someone with very straight hair should be less than that on someone with very curly hair, as you can see in my photographs. To work out their mathematical model of the ponytail, the researchers worked with dimensionless parameters, just so they could get the general shape. Along the way, they defined what may be the most charming parameter I have ever seen in a physics paper: the Rapunzel number, which is a dimensionless length for ponytails, used in the scaling calculations. It is named after the woman in the fairy tale as famously written by the Grimm Brothers. Rapunzel was banished to a room in a tower but, because her hair was long enough to reach the ground from a window in the room, a Prince was able to climb it like a rope to reach her. From scaling techniques to hair styles to fairy tales, physics is indeed everywhere. June 2012 In a sheet of paper (or light-weight cardboard), cut a circular opening that is smaller than a coin. In the United States, I use a quarter (25 cent) coin, which has a diameter of 2.4 centimeters, and cut an opening with a 2.0 centimeter diameter. The challenge is make the coin go through the opening without ripping the paper. But obviously this is impossible, because the opening is smaller than the coin. Before you play the video solution, try playing with the coin and paper. Can you think of any way to manipulate the paper so that the coin passes completely through the opening? That is, can you increase the width of the opening? What the figure illustrates is that the rolling motion we see can be taken as a combination of two simpler motions: The wheel rotates around its center like a merry-go-round, as in part a of the figure. All parts of the wheel move rightward in straight-line motion (translation), as in part b of the figure. Let’s call the straight-line speed v. Then every point on the wheel is moving at that speed to the right. But every point (except the center) is also in rotation around the center. At the contact point with the floor, the wheel has rightward speed v but is also moving leftward at the same speed v because of the rotation. The result is that the speed of the wheel at the contact point is zero. The center is moving to the right at speed v but has no rotational motion. So, its speed is just v.
How about at the top? There the straight-line speed is v rightward but so is the speed due to the rotation. Thus, the top point is moving rightward at twice the speed of the center. In short, the contact point is momentarily stationary and the top part is moving the fastest. For evidence of this difference I photographed a bike wheel while it was smoothly rolling. During the exposure, the lower spokes are clear because they barely moved, but the higher spokes are blurred because they moved appreciably. Here are similar photographs of wheels on moving cars. Notice that the bottom of the hub caps are clear but tops are noticeably distorted and blurred. In case you want to make your own photographs, let me explain that I shot the photographs with the camera set on automatic exposure. When the wheels were in bright sunlight, the exposure was so brief that the image was essentially a freeze-frame, with no blurring. The images here were shot in dimmer light: the bike wheel was in the shadow of building and the car wheels were in dim light just before sunset. September 2012 Take a standard pub beer glass, such as my Guinness glass seen here. Which is greater, the height of the rim from the table or the circumference around the rim? Well, maybe that is too obvious. How about if we place several objects, such five coasters and a cell phone under the glass? Which measure is then greater? Here is video that shows the answer and also demonstrates how you can make the comparison with the use of a paper napkin and pencil. Chances are that, like me, you guessed wrong. If I laid out several straight objects side by side, I could easily judge which is the longest. I can mentally extend lines between the objects. The difficulty with the beer glass is that I have almost no experience in mentally “cutting” a circumference and laying it out flat. Indeed, I am visually misled in comparing not the circumference, but the diameter, which is about 1/3 the size. For my Guinness pub glass, the height is 16.0 cm and the rim circumference is 26.5 cm. You know, if my physics professor job does not work out, maybe I could make a living by working my way through the local pubs and bars with this trick. Here is a similar demonstration but with a tennis ball attached to the bottom end of the Slinky. In the second video, the professor demonstrates that a shock delivered to one end of a horizontal Slinky does not immediately affect the other end. Instead, a shock wave must travel through the length of the Slinky to reach (and thus move) the far end. When the upper end of the hanging Slinky is released, the lower end is already being pulled downward by gravity. There is no delay in the application of that force. However, the lower end is also being pulled upward by the stretched coil. Initially, those upward and downward forces balance---that is why the lower end is initially stationary. When the upper end is released, the coil gradually becomes less stretched in the part that is falling part but the part that is pulling up on the lower end still has the same stretch and thus still counters the gravitational force on the lower end. Only when the stretch just above the lower end disappears does the lower end lose it support and begin to fall. Here are more videos, with the first two showing a Slinky against a plain background. 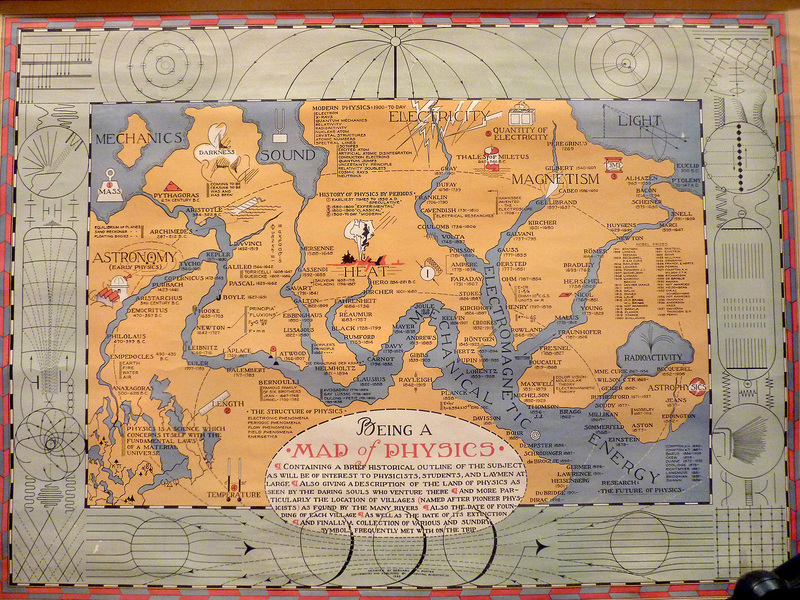 The blog site is a wonderful resource of various real and imaginary maps. One, for example, shows the tartans and kilts associated with the various clans in Scotland. Another map, which appeared on a stamp, almost caused a war. Challenge 1: Someone at the pub first breaks off the two pointed ends on a common wood toothpick and then breaks the remaining section in half to get two sticks of about equal lengths. He then squeezes one of the sticks between the thumb and first finger of his left and then squeezes the other stick between the thumb and first finger of his right hand. Next, he taps one of the sticks against the other to show that they are each rigidly held by thumb and finger. Then he moves them to make one more tap but magically the two sticks appear to move through each other because they end up being interlocked, with each stick extending through the loop formed by the stick, thumb, and finger on the other hand. How is that possible? Challenge 2: Can you cut an ordinary holiday card or business card such that you can crawl through the opening? That seems impossible because the cross-sectional area of the card is obviously much smaller than the horizontal cross-sectional area of your body. The trick is to cut the card so that you greatly increase the perimeter, by transforming much of the interior to become part of the perimeter. As explained in the first video, the trick with the two sticks is to wet one end of one stick with saliva. A thin layer of saliva acts as an adhesive and will stick to a surface. Here, let the surface be a thumb. For that hand, the finger can be pulled away from the stick with the stick falling---it is glued to thumb. So, the other stick can be moved through the gap left by the pulled-away finger. The finger is then moved back into place and the sticks seem to have passed through each other. To conceal the momentary gap, the hand motion is done quickly and with part of a hand blocking any view of the gap. Some people commonly use this adhesive property of saliva when they lick their fingers in order more easily pick up or turn paper with the fingers. To buy fresh produce in my grocery store, I must load the produce into plastic bag that I pull off a roller. Each bag comes off flat, and so I must peel one side of the opening from the other. Because the two sides adhere to each other (probably because of static charge on each), separating them is difficult. But if I lick my thumb and finger and then rub them on opposite sides of the bag, the two sides easily separate. Well, of course, licking my fingers as shop is pretty unsocial. I get about the same effect if I, instead, wet my fingers with the water that is occasionally sprayed onto the lettuce to keep it fresh. Water works almost as well as saliva but I believe the proteins in the saliva improve it as an adhesive. March 2013 Take a dollar bill or a similar rectangular strip of paper. Can you attach two common paperclips to it at separate locations such that by pulling on the paper (without touching the paperclips), the paperclips become linked? As shown in the following video, you fold the paper into three equal size sections, with the fold lines running across the short dimension of the paper. Then you attach one paper clip to connect the near section and the middle section. Then you attach the second paper clip to connect the middle section and the far section. Last, you pull horizontally on the two ends of the paper. The paper clips move toward each other and then one is pull into and through the other, linking them. This is certainly cute pub trick but the locking mechanism used in industry anywhere? Even more interesting would be a natural occurrence. One of my students had a similar experience. He was riding in the back of the flat bed of a pickup truck when the driver slammed on the brakes. The truck almost immediately stopped, but my student kept moving forward, until he slammed into the back side of the truck’s cab. The collision left permanently paralyzed below the waist. In this next video, a truck driver keeps on moving while his truck suddenly stops. As a result, he crashes through the windshield. Here is a screen capture. The man (in the stripped shirt) is outside the cab and horizontal. The braking system employs radar to detect a vehicle in front of the Volvo truck. If the truck driver does not take appropriate action upon being warned about the vehicle, an automatic braking system spring into action, to stop the truck before it collides with the vehicle. The braking system can also detect pedestrians and bicyclists in the path of the truck. Notice how he manages to leap from step to step. Normally we would squat and then push off from a step with our legs, to propel our body upward and slightly forward. But upside down on his head, he cannot somehow compress his neck and then uncompress it to hurl the body upward and forward. Instead, he brings his legs downward to lower his center of mass. Then he hurls his legs upward and slightly forward. Their motion then drags the torso upward and forward, so that he lands on the next step. May 2013 Scary things are fascinating things. Maybe that is why I am fascinated by really deep holes in the ground --- I can imagine myself falling down the shaft like Alice falling into the rabbit hole and landing in a mystical world. Here is a video of a 450 m shaft that had been drilled vertically downward into a mountain side in order to drain a lake into a lower lake. Listen to the sound of the rock landing at the bottom. The intention of the shaft was to drive a hydroelectric plant. Once the shaft was completed, the area around the hole was filled to form a small lake, with a valve that could prevent the water from flowing through the shaft. During the day, the valve is turned so that water falls down the shaft and into a lower lake. The flow drives the plant generators so that electricity is produced during the peak demand. At night when the demand is much less, electricity is used to pump the water back up to the higher lake, to be ready for the next day. Although that pumping is expensive, the cost is much less than the profit the company makes during the peak demand. An explanation, along with an animation, is in one of the videos at the following site. Search there for “Throwing a rock down a 1500 ft hole; how and why it was made”. You can approximate the depth of a hole by measuring the time between the release of a stone into the hole and the instant the sound of its final impact reaches you. That time interval is the total of the time for the stone to fall and the time for the sound of the impact to travel back up to you. Both times involve the depth of the hole. t1 = square root (d/4.9 m/s^2). For example, if the total time turns out to be 11 s as in the video, then the depth is about 450 m.
Here is an even more extreme example, in which the total time is 35 s. Again under the assumption of free fall, the depth is about 3.2 km. This hole is located near the Dugway Proving Grounds in west Utah. The people who shot the video conducted several experiments in addition to dropping the stone, including lowering a rock on a 1000 foot fishing line, which was not long enough to reach bottom. I have one more video, a deep hole in Israel, but I must warn you that a medium-level curse word is uttered by one of the young men in astonishment about the depth of the hole. What caught my attention with this video is the sound made by the falling stone. We do not hear the dull thudding as in the previous video. Instead we hear a zinging sound, which is known as a whistler. Normally I can demonstrate a whistler with a handclap at the end of a long pipe or culvert, with you at the other end. You hear a series of echoes, one involving a single reflection from the interior wall, another involving two reflections, and so on. Each extra reflection means that the associated sound takes a longer path to reach you and thus there is a delay in that echo. So, you hear a series of echoes --- the whistler. As the stone falls in this last hole, each collision with the wall sends a series of echoes back up the hole, and so we hear multiple whistlers. June 2013 Start with a rod, candle, table knife, or some other long cylinder positioned across your hands and under the thumbs, with palms together. Your task is to invert the rod so that it is then below the palms, which are then horizontal. You need to do this simply by twisting your hands to reposition them and the rod. And once you have mastered this maneuver, try reversing it. June 2013 From introductory physics, rotation of an object results from one or more torques acting on the object. And a torque is the product of a force and a lever arm (the distance from the center of rotation out to where the force is applied). For a simple example, here is the force applied to one end of a rod that can pivot around its midpoint, as seen from overhead. The torque due to that force will cause a counterclockwise rotation of the rod. Well, that is how I chalk it on the board when I teach rotation physics but here is far more delightful demonstration: A young man lies across two moving hand belts on adjacent escalators, one belt moving upward and the other belt moving downward. The frictional forces between him and the belts produce torques on the man, rotating him. July 2013 Imagine a stairway built in the style of those seen in a picture by the Dutch graphic artist M. C. Escher: You climb up the stairs only to end up at the bottom again. Of course, our common sense rebels at such a stairway --- if this construction exits, then our understanding of reality is very shaky. We now have many fake videos on the web. Most are obviously wrong --- their lack of proper physics is obvious and I simply mouse-click to the next video. But this RIT stairway illusion is captivating, and I’ve watched the video many times even though I know how Lananileo used split-screen recording to set up the illusion. I’ve seen the Escher art works, similar impossible pathways in psychology experiments, and the impossible stairways in the old Doctor Who episode Castrovalva. Deep down, I guess that I wish such impossible things were true, just to liven up my everyday world. July 2013 Groucho Marx was a humorist and actor in early films and television and was one of the Marx brothers. In some of his comedies, he displayed a quirky style of walking that is now known as Groucho walking. As he moved, he lowered his torso and then kept his center of mass at an almost constant height from the floor by walking with bent legs. In recent years Groucho walking and Groucho running have been researched by physiologists. They are also found in various exercise routines because they burn up Calories faster than normal walking and running. One goal of studying the gait of walkers and runners is to distinguish running from walking. One obvious way is to note that there is an aerial phase to running (both feet are off the ground) but not in walking. Another way is to consider the energies involved with the motions. In normal walking, there is a smooth exchange between the kinetic energy and the gravitational potential energy, which are out of phase. That is, when the body’s center of mass is highest, with the greatest gravitational potential energy, the center of mass is moving forward at its slowest, with the least kinetic energy. This stage occurs when the center of mass comes up over the supporting ankle. As the center of mass then moves forward of the ankle, it lowers, decreasing the potential energy, and speeds up, increasing the kinetic energy. In normal running, the changes in the kinetic energy and gravitational energy are in phase but there is also strain energy that is stored periodically by the legs. When the center of mass lowers, it also slows and energy is stored in the bent legs much like you can store energy in a compressed spring. When the center mass rises, it speeds up, with both increases in energy coming from the energy stored in the legs. Here is a related style of walking introduced by the legendary rocker Chuck Berry. In the 1950s, with the beginning of rock and roll, he first demonstrated his duck walk. Is duck walking a good exercise like Groucho walking? Well, Chuck Berry is currently 86 years old and still rocking. So, I think we should all duck walk or Groucho walk whenever we walk somewhere, such as to the next class. Aug 2013 In a Spanish hotel room, two men went to sleep on bunk beds (one bed above the other) that folded out from the wall. When the higher man awoke the next morning, his friend was nowhere to be seen but his possessions were still in the room. Curiously, the lower bunk bed had been folded back up against the wall. Much later in the day, the room maid arrived to prepare the room for the next guests. However, when she attempt to fold out the lower bed to change the sheets, she could not get it to move. When the hotel manager arrived, they discovered that the missing guest was wedged between the wall and the folded up bed with his right arm dangling onto the floor. The trapped man was dead, and his arm prevented the bed from rotating out to the horizontal position. Firemen had to dismantle the bed to free the body. Here is a sketch of the situation with the bed horizontal, based on the forensic analysis in the research paper listed below. The bed can rotate between its vertical and horizontal positions by pivoting around a support rod that runs along its length. When rotated to its horizontal position, an element prevents further rotation downward. The mattress and bed are rectangular, with a combined weight of 1604 newtons. When they are horizontal, we can assign their collective gravitational force to their center of mass, which is located 0.115 meters outward from the pivot. If a person lies on the bed, we can assign the collective gravitational force on the person to the body’s center of mass. Of course, the person can move somewhat over the bed, so the center of mass can in a variety of locations. But here comes the chilling physics. If the body’s center of mass is closer to the wall than the pivot, then the gravitational force on the body tends to rotate the bed to the vertical position. In my diagram, the force on the bed-mattress center of mass tends to give a clockwise rotation: The torque due to the force is clockwise. If the body’s is near the wall, then the force on it tends to give a counterclockwise rotation and torque. In this case we can calculate a torque by multiplying the force by the lever arm, that is, the distance between the pivot and the point where the force acts (the center of mass). Here are some numbers: the bed-mattress has a weight of 1604 newtons and a lever arm of 0.115 meter, which gives a torque of 185 newton-meters. The man had a weight of 1030 newtons. If we assume that during the night he rolled over toward the wall, putting its center of mass at 0.20 meter from the pivot, then he produced a torque of 206 newton-meters. That counterclockwise torque overwhelmed the clockwise torque, and the bed rotated to its vertical position, squeezing the man hard against the wall and compressing his chest so that he could not breathe. He died of asphyxiation. Physics is everywhere, and sometimes it can kill you. March 2014 Here are two examples in which leverage is cleverly used in Russia. In the first we see a car rescued from an ice covered water body. The car is almost completely submerged in the ice. Bringing a heavy tow truck out onto the ice to pull the car free would have disastrous. Instead, enough of the ice is cracked in order to slip a wood frame under the rear of the car and loop ropes around the rear wheels. A rope then runs back to the heart of the operation: The rope wraps around a pole that has been driven into the ice. A long horizontal pole is attached to the vertical pole. Several men push the horizontal pole around and around in order to wrap up the rope onto the vertical pole. As the rope wraps up, the car is gradually pulled up and out of the ice. If the men had pulled directly on the rope, they would have been unable to pull the car out by even a little bit. Instead, they used leverage. Rotating the vertical pole required a large torque. They provide that torque by pushing on the horizontal pole with a modest force. The clever part is that they applied their push at a large distance from the vertical pole. Since their torque is the product of force and distance from the rotation axis, their torque was large. Here is another Russian clever use of leverage. Logs are to be loaded onto a truck, but the logs are so heavy that manual loading would require several men. Instead, a metal pole is attached to the rear wheel of the truck such that as the wheel rotates when the truck moves forward, the log is pulled by a rope attached to the outer end of the pole. The rotating wheel applies a large torque to the inner end of the pole, which then applies a torque to the outer end, pulling up the pole. April 2014 Here is a repeated challenge: How can you open a bottle of beer or soda without the common bottle opener? The bottle is sealed with a cap that has been crimped onto the top. The usual bottle opener uses leverage to pop the cap off the top. One end of the opener touches the top of the cap and acts as a pivot. A rigid projection fits under the edge of the cap. When the outer end of the opener is lifted, a modest force there (said to be the “effort”) produces a much greater force under the edge of the cap (which is said to be the “resistance”). This arrangement is said to be a type 2 lever because the resistance is between the pivot and the effort. In a physics class, we explain the action in terms of a torque, which is the product of a force and a lever arm (the distance between the pivot and the point where the force is applied). The modest force on the outer end of the opener produces a large torque because of the large lever arm. An identical torque is then produced at the edge of the cap, but because that lever arm to that point is short, the force is large, large enough to pry the cap off the bottle top. You can also pry off the cap with a type 1 lever, where the pivot is between the effort and the resistance. Firmly grasp the bottle with the top of your top finger slightly higher than the bottom edge of the cap. Then place almost any rigid object (key, writing tablet, chopsticks, etc.) just below the cap edge. Now press down hard on the outer end of the rigid object, forcing it to rotate around your finger. Several videos on the web claim that bottle cap can be released if the bottle is first placed on a flat magnet (such as the type used to post messages on refrigerator doors) and then tapped with a coin. Of course this does not work. Why in the world would it? But many people have fallen for the prank, I suppose because anything magnetic is inherently mysterious and thus capable of causing magic. However, for the right type of bottle, you can open the bottle with the aid of currency, such as a $20 bill. No magnetic field is needed, just a twist-off cap. April 2014 Here is video showing a collision between two ships, with the larger one hitting the side of the smaller one just in front of the stern (rear). What caught my attention is the counterclockwise rotation that the collision gave the smaller ship. The force on the smaller ship produced a torque about the ship’s center of mass, much like you can produce by pushing on the rim of a merry-go-round. July 2014 Repairs to transmission lines supported by poles (tall tree trucks) are normally made by a repair person climbing a pole. The standard way is to climb by using boots with spikes along the inner edge of the soles and by using a harness wrapped around the pole. The climber rams the spikes into the sides of the pole, moves the harness up the pole, and then steps up by releasing the spikes on one boot, moving that boot up the pole, and then ramming the spikes back into the pole. The climber then leans forward somewhat toward the pole to loosen the harness, moves the harness up the pole, and then leans back to increases the friction between the pole and the harness. The interplay of forces on the climber and harness forms a basic problem in physics textbooks. Here is drawing showing the force vectors when the climber is stationary. The downward weight vector is balanced by the upward force at the spikes and the upward frictional force on the harness. The horizontal forces (at the harness and spikes) balance each other. The torques due to these several forces (calculated around any given rotation axis) also balance, and the climber is said to be in equilibrium. The physics is the same. The weight is balanced by two upward forces, the horizontal forces balance each other, and the torques also balance. However the climber does not lean back to set up the forces. Rather the forces are set up by the downward tilt of the main support rod once his weight is placed on the outer end. July 2014 In this video, a horizontal matchstick is wedged between two matchsticks that are stuck in the top of a match box. The horizontal matchstick is then set on fire about midway along its length. After a few seconds, it leaps into the air, landing a short distance away, where it continues to burn. Why does it leap? The key is that the two vertical sticks are not truly vertical because the horizontal stick is slightly too long to allow that. As a result the two vertical sticks push on the two ends of the horizontal stick. The pushes are certainly toward the middle but also slightly upward. When the horizontal stick begins to burn, it weakens and begins to curve upward. The forces on it from the vertical sticks are then slightly upward. As the curvature increases, those end forces become angled upward even more. Eventually the horizontal stick is propelled upward. You can see the same type of motion with a card (playing card, business card, etc.) held in place between your thumb and first finger. Start with the card bent slightly upward and then gradually move the thumb and finger toward each other. The motion increases the curvature of the card until the card shoots outward. August 2014 One of the common myths (I guess it would be a rural myth instead of an urban myth) is that you can tip over a cow while it is standing and sleeping. I have no idea why anyone would even entertain hurting such a valuable and lovable animal like that, but let’s consider the physics alone. Is it possible for a person to push sideways on a cow’s rib cage so that the cow tips over and onto the ground? Here is Sheldon arguing that physics will not allow such a thing (the link to the video clip is at the bottom of this story). First of all, if the cow is standing, it is awake, not sleeping. As explained in this video link here, a cow cannot stand while sleeping like a horse because its knees do not lock in place like those of a horse. A cow might be standing quietly but it is contemplating its existence, not sleeping. Given that the cow is awake, if you push on cow, it will merely step away from you, either forward or to the side. However, suppose that the cow is arrogant and chooses to ignore you, figuring that you are pushing on it because you have nothing better to do after spending the day in a pub. Even if the cow does not move out of the way, your force is too weak. You are trying to rotate the body around a ground-level axis through the hooves on the opposite side of the cow. Here is a sketch in which a force attempts such a rotation in the counterclockwise direction. In physics jargon, you are applying a positive torque to get a positive rotation. However, opposing your torque is a negative torque (clockwise) around the rotation axis due to the gravitational force on the cow. That force is said to act at the center of mass of the cow. Because the cow’s weight is very large, that opposing torque would be much greater than your torque, and thus the cow will just turn its head and smirk, with a look that suggests you should return to the pub. How about if several people attempt to tip over cow? The combined force then might indeed produce a torque to overcome the gravitational torque. However, you still have to convince the cow remain stationary instead of just stepping aside and watching everyone fall facedown onto the ground (and whatever the cow has already left there). I think the only way a cow could possibly be tipped is if several people run at the cow with arms outstretched and hit the cow simultaneously. But I think the cow would then be injured (broken ribs, perhaps on both sides of the body). However, only very fast runners could pull this off. Not only would they need to run fast at the cow, but then they would need to run fast away from the shotgun blasts from the rancher. August 2014 Here are two videos in which the commentator Derek Muller cleverly sets us up for a wrong guess, which would result in a violation of the law of conservation of energy. (If that were to happen, we would be in big trouble with the energy sheriff in the sky.) A rifle is positioned vertically such that its bullet strikes the midpoint of a loosely suspended block of wood. The bullet is buried in the block and together they jump a certain height. The rifle is then repositioned so that its next bullet will strike near the right end of the block. In this first video we have to predict what the block will do now. Obviously, it will still jump up but it also will be spinning because of the off-center impact. But the Muller asks us to predict: Will the block now jump as high as previously, not as high, or lower? I think that most people who have had a year or so of physics will choose “not as high.” As some of the interviewed people said, the fact that some of the energy now goes into the rotational kinetic energy means that less will be left for the translational kinetic energy of the upward motion. Thus, there will be less energy going into gravitational potential, meaning a shorter jump for the block. However, the height depends on the speed of the block’s center of mass just after impact, and that speed depends on the conservation of momentum of the bullet and block during the collision. Because the bullet has the same momentum in the two demonstrations, the block is given the same upward momentum by the impact and thus also the same initial speed. So, it goes the same height. But wait. Where does the energy for the spinning come from? Well, it comes from the bullet. However, this is not extra energy in same violation of the conservation of energy. The fact is that in such completely inelastic collisions (where the colliding objects stick together), the kinetic energy is not conserved. A lot of the energy is transformed into other types. The objects warm slightly; there is ripping and deformation; and you can hear a sound wave from the impact. In the second demonstration, some of the bullet’s kinetic energy shows up in the block’s rotational kinetic energy because of the way the block begins to spin out of the way of the bullet during the impact. Here are the video links. Below them I sketch out a calculation that shows that in the first demonstration, nearly all of the bullet’s kinetic energy is lost to other forms of energy and only a small part goes into the block’s upward jump. We take our system to be combination of bullet and block. The bullet has mass m and initial speed v. We treat the block as being a uniform rod of length L and mass M. If there is no net external force acting on a system, then the momentum of the parts can change but the total momentum cannot (because, by Newton’s second law, a force is needed to change the momentum). Here the gravitational force is just such an external force. However, the collision of the bullet and block is so brief that we can neglect the impulse from the gravitational force during the collision. where V is the speed of the bullet+block just after the collision. V = mv / (M + m)V.
= 0.5mv2 - 0.5(M + m)V2. Loss = (0.5mv2) (m/M + 1)-1 = (initial) (m/M + 1)-1. Because the bullet’s mass m is so much smaller than the block’s mass M, the ratio m /M is much less than 1 and this loss is almost the entire initial translational kinetic energy. So, only a small part of the initial kinetic energy ends up in the upward jump of the bullet and block. The rest goes into other forms of energy. For convenience let’s reference angular momentum to the block’s center of mass rather than some other point. Then the final angular momentum will be only that of the rotation of the block and bullet around the center of mass, and we do not need to consider the motion of the center of mass itself which is along a line through the reference point. A frequent irritation in a pub or restaurant is a wobbly table. The instability is, of course, due to not having all four legs rest firmly on the floor. So, the table can rock back and forth around a rotation axis connecting the two legs that always make contact. In one orientation, one of the other legs makes contact, and in the other orientation, the fourth leg makes contact. If the instability is due to the legs not having the same length, the only solution is to wedge something solid beneath the shortest leg. Of course, we usually just use tightly folded paper, but the paper gradually yields under the pressure (or gets kicked out of place) and then the instability is reestablished. However, as demonstrated in the following video, there is a better solution if the problem is due to an uneven floor. Keeping three legs against the floor, rotate the table around a vertical central axis. At some point during the rotation, the fourth leg will touch the floor and then the table will be balanced. The given explanation is certainly mathematically correct but it is convincing only if you accept the claim that the rotation would eventually force the fourth leg below the floor surface. Let’s see if we can make physical sense of the balancing. Suppose the fourth leg is above a dip in the floor. If you maintain floor contact with the first three legs as you rotate the table, the fourth leg eventually must run into one side of the dip and also make contact. Now one of the first legs will be in the dip but you have maintained its contact with the floor. Of course, if you picked up the table and then rotated it you would not solved the problem because you would again have noncontact with whichever leg is over the dip. October 2014 Previously, I discussed how you can open a bottle of wine with a shoe. Yes, a shoe. Here is another way to open a bottle without the proper corkscrew opener. The purpose of the corkscrew is to dig its way into the soft cork so that you have a handle on the cork. You can then pry the cork out of the bottle by pulling upward on the corkscrew. But the friction between the cork and the interior of the neck of the bottle is large. That friction is said to be static friction because there is initially no sliding. The downward frictional force on the cork matches your upward pull on the cork. But if you pull hard enough, you can exceed the maximum value of static friction, and then the cork begins to slide and the friction actually decreases. Thus, getting the cork to slide is the main challenge. One way is to twist the cork. The rotation itself won’t bring the cork out of the bottle, but once the cork begins to rotate, the friction is reduced and then a moderate upward pull can be enough to remove the cork. If you lack the corkscrew, any device that can dig into the cork can be used. In the first video here, a common key is used. Once inserted, you can push horizontally on the key start the rotation while also pulling upward on the key once the static friction is overwhelmed. In the second video, a pair of scissors is used, but notice that the woman could easily have run a blade through her hand. This technique might be OK for the first bottle of wine, but certainly not for the second bottle after the first one has been drunk. The same danger of puncture lies in the third video in which a knife is used. However, the use of a carpenter’s screw hanger is safe enough, and the use of a bicycle pump to increase the internal pressure is not only safe but inspired. Still, I cannot recommend you use this technique on a first date if you have any hope of a second date. November 2014 A standard physics problem and demonstration involves an object moving into a vertical loop and maintaining contact to complete the loop. The object might be a block moving along the track without friction or a ball or disk rolling smoothly along the track. The object might be given an initial speed on a horizontal track or it might gain that initial speed by coming down from an initial height. Normally, the problem focuses on this question: When the object enters the loop, what is the least speed that will allow it to maintain contact with the track and complete the loop? If it enters with more than that critical speed, it easily completes the loop, but if it enters with less than the critical speed, it falls off the track before reaching the top of the loop. Let’s consider a ball sent rolling along a horizontal track toward the loop. The track supports the ball with an upward force called the normal force, where the adjective “normal” means that the force is perpendicular to the track. When the ball enters the loop and travels upward, the track continues to push on the ball with a normal force that is always perpendicular to the track at the ball’s location. That force deflects the ball’s travel so that the ball continues to follow the curvature of the track. The tricky part is that as the ball travels upward, it slows and the normal force weakens. If the ball enters the loop with the critical speed, the normal force disappears just as the ball reaches the top of the loop, but it then begins to strengthen as the ball travels down along the rest of the loop. However, if the ball enters the loop with less than the critical speed, the normal force disappears before the ball reaches the top of the loop. That means that the ball loses contact with the track and flies off of it through the air. So much for a ball moving through a loop in the traditional physics demonstration or homework problem. Are there other examples, perhaps dangerous or even potentially lethal examples? Well yes. Calculating the critical entering speed is more difficult when the object is long compared to the radius of the loop. Here in this experimental setup and after several failures, the young men finally resorted to using a pickup truck to get enough entering speed. Using a “pocket bike,” this young man experimentally discovers that he needs a long run-up distance to get enough entering speed. Here … first shows us what has become a standard skateboard trick. But then he raises the existential question: What happens if the top of the loop is missing? In a classroom demonstration, the ball would just fly through the air, crash into the far side of the loop, and then fall down. But could an expert skateboard regain his balance after hitting the far side? Can the trick be done with a car or motorcycle? Well, yes, though a mistake could be fatal. Yes, just running. No car, motorcycle, or skateboard. Just running into the loop. Here is Damien Walters running a loop-the-loop. https://www.youtube.com/watch?v=OTcdutIcEJ4 This is not only difficult to accomplish but also difficult to calculate. When Walters begins to climb the loop, he is propelling himself upward by his foot on the loop. None of the other examples involve such a propulsion. Also, he is not small relative to the loop’s radius, nor does he make contact all the way around. Rather, he almost leaps from contact point to contact point. November 2014 Place an ordinary fork, spoon, and coffee mug on a table (or bar top). (By normal fork, I mean the type with curved metal prongs, not the flat plastic kind you might get in a fast-food place.) The challenge is move the spoon into the cup without picking up any of three items. However, you can touch the spoon or fork. Of course, sliding either around on the surface will not get the spoon into the cup, which certainly requires that the spoon leave the table. But since you cannot pick up the spoon or turn off gravity (I’ve tried --- it cannot be turned off), you must use physics to meet the challenge. Initially position the spoon with its handle against the cup and oriented radially outward, the convex side on the table. The fork should also be radially outward, as an extension of the spoon and with the handle lying under the curve of the spoon’s convex surface. The convex side of the fork should also be on the table. Now slam down on the prongs of the fork. The fork rotates around its contact with the table and the fork handle slams into the underside of the spoon. Because that underside is curved, the force on the spoon is both upward and toward the mug. And because the spoon handle is up against the mug, the spoon cannot simple slide away from the impact. Instead, it rotates around the handle’s contact point on the table and flips up into the air. After rotating several times, it lands in the mug. Here is a video showing the trick but what we do not see is the times when the spoon missed the mug. If you want to demonstrate this trick, you will need to find the appropriate fork and spoon, and then you will need to practice. Eventually you will master the trick. So, if your schooling work is not going very well, you have a career ahead of you of flipping spoons in mugs in pubs and bars. February 2015 Lego bricks (under copyright by Wham-O, Inc.) are small, plastic, toy blocks that come in various shapes. These constructions beg the question: What is the limit to the height of a Lego tower? Assume it consists of a column of single bricks that are somehow stabilized so that it does not buckle or fall over due to some disturbance such as wind. As each additional brick is added to the top, the lowest brick is compressed more. Eventually it will fail. Rather than dramatically collapsing, it will begin to deform (melt) because it is plastic. The idea was tested in a compressor by placing a Lego brick between the two horizontal plates. As the top plate was forced downward, the pressure on the brick gradually increased, until the brick effectively melted. The researchers tested several bricks. The average of the limiting downward forces was 4240 newtons, which is equivalent to a mass of 432 kilograms resting on the brick. The researchers then calculated that because each brick has a mass of 1.152 grams, that limiting force was equivalent to a having a tower height of 3.5 kilometers. Of course, building and stabilizing such a tower to check this limit would be just about impossible. In contrast, here is a pressure test in which a concrete cylinder is squeezed. The failure point comes at much larger force value (over 6.7 million newtons), but the failure mechanism is much different. The concrete is obviously not plastic, will not gradually deform, and fails in a much more dramatic (even frightening) fashion. That type of failure draws an audience but watching plastic brick deform and melt would not. April 2015 Starting in June 1944 during World War II, the German forces in western Europe began launching thousands of flying bombs into England. The bombs, known as V1, doddle bugs, and buzz-bombs, had a length of about 8 meters, a wing span of about 3 meters, and carried 2000 kilograms of explosives. 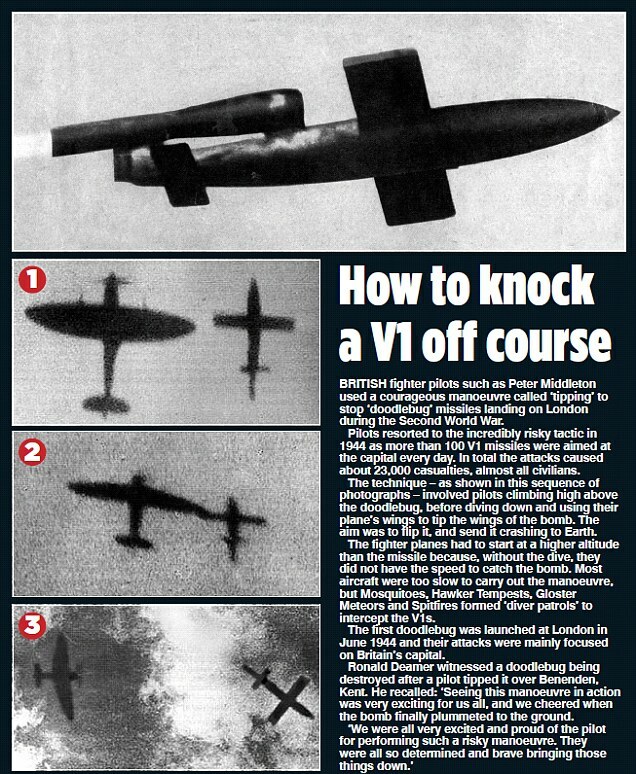 Once launched from a ramp (or sometimes from an airplane) that was aimed at London or some other part of southeast England, the V1 was stabilized by a gyroscope so that it maintained its aim. To defend against the V1, England mounted artillery along its southeast coastline and lofted large helium balloons (blimps) with long metal tethers to snare the flying bombs or otherwise disrupt their flight. Aircraft were launched to shoot down the bombs but that procedure proved very dangerous because a pilot had to be so close to a V1 to make the shot that the bomb’s explosion could damage or even destroy his aircraft. Another defensive procedure was soon put to use. Some of the English aircraft, such as the Spitfire, could match the V1 speed of about 600 kilometers per hour if they would first fly well above a V1 and then dive down to it. After pulling alongside the V1, a pilot would gradually move closer until he could rotate one of his wings down onto the nearby wing of the V1. The subsequent jolt to the V1 would disrupt its gyroscopic stability and the bomb would then spiral down into the ground (or English Channel). Here is a rare photograph of such tipping. And here is an animation that depicts the procedure. May 2015 When a turtle is overturned onto its shell, it is in a desperate situation because it is defenseless and its protective shell is then rather useless. Thus, a turtle must quickly right itself. Some types of turtles can use their claws to grip the ground and thus leverage themselves to tilt over. Other types will throw their long necks in one direction in order to rock their body in the other direction. All types of turtles must overcome a potential-energy barrier because the center of mass must be moved upward if it is to pass over the left or right edge of the shell. The problem is much like you rolling a toy block over an edge. Place the block down on one face. Then roll the block around an edge so that the block ends up face down on an adjacent face. In that roll, you have to provide the energy for the center of mass to move upward to pass through the point where it is directly over the edge in contact with the table. A turtle with a flat shell must make the greatest effort because it has a high potential-energy barrier. Does a turtle with a high shell have an advantage? Maybe. This line of thought began with a mathematical breakthrough in Hungary. In 2006 an engineer Peter Varkonyi and mathemetcian Gabor Domokos in Budapest designed a curious toy known as the gomboc. It is a solid body with a uniform distribution of mass (no hidden concentrations), convex sides, one point of stable equilibrium, and one point of unstable equilibrium. In math jargon, it is known as a mono-monostatic body. The first “mono” refers to unstable equilibrium --- the toy can be balanced on that point but if it is even slightly disturbed, it will roll off the point. Curiously, the gomboc then rolls across one or two sides until it lies on the point of stable equilibrium. That point is said to be stable because if the gomboc is rolled off the point and then released, it simply rolls its way back to that point. So, is an inverted turtle with a high shell like a gomboc on its unstable point, ready to roll back to its stable orientation? One measure of a turtle’s gomboc-like shape is called the R index, which is the ratio of the shell height to the maximum shell left-right width. A larger R index corresponds to a shell with a greater curvature. The hitch here is that a turtle is certainly not uniform in its mass distribution and thus comparison of a turtle with a gomboc is probably unfair. Indeed, a recent study shows that a turtle’s ability to right itself is only poorly correlated with its R index. One reason is that the external surface and edge of a shell is highly variable among turtles, even of the same types. Much of American and Canadian football involves the physics of collisions between two players. What caught my attention in this next video the running back Marshawn Lynch of the Seattle Seahawks is the second scrimmage. Lynch is both powerful and skillful, but in that scrimmage he has several defenders pulling on him to stop his run and some of his teammates pushing on the defenders. He keeps his powerful legs running, but how can he manage to move forward and then break free? One reason that he can continue is that with that many forces pushing and pulling on him in various directions, the net force is small. That is, a horizontal pull on one side is countered by an almost equal horizontal pull on the opposite side. The defenders are probably also trying to pull downward but they are so compressed against Lynch that those downward pulls are feeble. Lynch is strong enough to know down a single defender; indeed he sometimes intentionally runs into a defensive player even when he could have avoided contact. However, two defenders might have an easier time bringing him down than a crowd of defenders. When the woman is pulled away from the point where the elastic bands are relaxed (the equilibrium point where the bands are not stretched), elastic potential energy has been stored in the bands. When she is released, the elastic force on her from the bands propels her back to the equilibrium point, but that motion transfers energy from the elastic potential energy into her kinetic energy and she shoots through the equilibrium point. Of course that means that she begins to stretch the bands in the other direction, until all of the energy is transferred back to elastic potential energy by the time she momentarily stops. The motion will not last long because the stretching and unstretching of the bands gradually transfers energy into thermal energy --- the temperature of the bands increases. Here is example of where SHM is used in an amusement park ride, with vertical motion. Ah, SHM for people is so much fun until, of course, when someone gets hurt. February 2016 Concrete has tremendous strength under compression (opposite ends pushed toward each other) but is normally weak when under tension (opposite ends pulled in opposite directions). Thus, it is useful in supporting buildings and bridges. Here is a video that dramatically demonstrates that even in compression, there is a limit for what concrete can withstand, said to be the ultimate strength. High-strength concrete has an ultimate strength of 40 million newtons per square meter, or about 5800 pounds per square inch. The concrete cylinders seen in the videos are weaker. Testing the strength of common concrete is, of course, important for us to understand if concrete structures remain stable after aging and weathering. Sadly, concrete structures sometime fail and people are hurt or lost. He purposely flies quickly and then abruptly stops before reaching the truck. That causes the bundle to swing forward significantly as it starts its pendulum motion. In such motion, the pendulum bob slows as ascends and comes to a momentary stop at its highest point. 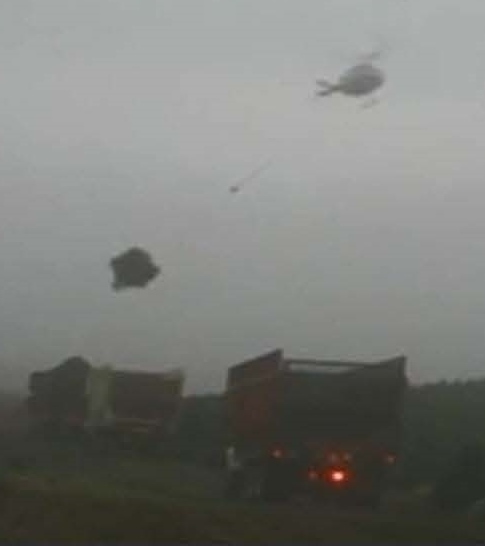 The pilot uses that slowing to his advantage by bringing the helicopter down somewhat, so that the slowing bundle neatly drops into the truck.